Using Grade 3 Ceramic balls, Magnetite finished triple cryogenically treated chromuim steel races and dual lip non contact seals these are as close to zero friction as ceramic hybrids get. The balls are made from pure Silicon Nitride with extreme high density from uniform compaction (3.25 g/cm3). The micro-structural development of this material during manufacture is second to none. These high precision Grade 3, SI3N4 pure ceramic balls are 3/1,000,000” from exactly round in sphericity. They are 60% lighter in weight, and 7 times harder than steel. Friction is reduced to near zero. 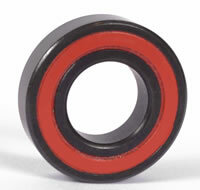 ZERØ series bearings feature our rust proof "MAGNETITE" finish. This is not a coating, but an actual change in the chromium steel surface that is more resistant to corrosion than 440 stainless steel. These races start with vacuum de-gassed alloy hardened to Rockwell C-64. These high precision races are cryogenically treated not once, but three times during the final "super polishing" phase. Cryogenic treatment means taking the races down to minus 300º Fahrenheit to nomalize the crystalline structure of the material so that the races will resist the hardness of the ceramic balls and get the maximum wear potential. This critical treatment to the races is left out by many manufacturers, but not by Enduro. To compliment this the retainers are nylon with Graphite and are virtually frictionless and the seals are "VV" non-contact labyrinth type, with 2 sealing lips. For more information, to order, or if you can't see what you need here, please contact us. Product prices are shown ex GST for overseas customers and for comparative purposes.